Crowdfunding—an online method of soliciting money from the general public for a business, project, or cause—is about to go through a seismic shift. And it could mean insane profits for some investors—profits that were previously unattainable due to government regulations. March 24, 2016 — New online crowdfunding Web portals won’t go live until mid-May, but a key House Republican is already renewing efforts to ease existing restrictions on how much money companies can raise via the innovative technique. Rep. Patrick McHenry (R-N.C.) introduced legislation (H.R. 4855) that would lift to $5 million the amount that an individual venture can raise under the crowdfunding exemption from securities law in the 2012 JOBS Act. That represents a fivefold increase on the $1 million cap now in the law. The Cambridge Centre for Alternative Finance at Cambridge Judge Business School and the Polsky Center for Entrepreneurship and Innovation at Chicago Booth School of Business are jointly launching the 2015 Americas Alternative Finance Benchmarking Survey. This survey will be a comprehensive and empirical assessment of crowdfunding, peer-to-peer lending (marketplace lending) and other forms of alternative finance across North, Central and South America and scheduled to be available in April 2016. FINRA Guidelines: How to Apply as a New Funding Portal? FINA has published guidelines for firms to register as funding portals for Title III, Regulation Crowdfunding. For your firm to become a registered funding portal with FINRA, your firm must complete the following steps. As of December 9, 2015, FINRA extended the review period for its proposed funding portal rules to January 26, 2016. 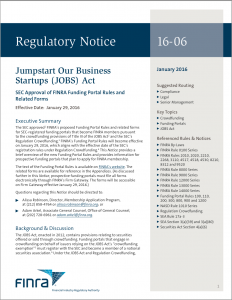 The new rules were promulgated pursuant to the Jumpstart Our Business Startups Act 2012 (JOBS Act) which “prohibits funding portals from a variety of activities, including offering investment advice or recommendations, soliciting transactions for securities displayed on their websites, compensating employees for securities solicitations, and holding investor funds or securities.” The proposed rules under review are (i) funding portal rules 100, 110, 200, 300, 800, 900 and 1200; (ii) related forms; and (iii) FINRA Rule 4518 (“Notification to FINRA in Connection with the JOBS Act”). See: FINRA’s Extension of SEC Review Period. the European Securities and Markets Authority (ESMA) issued today a Questions and Answers (Q&A) solicitation in order to promote the sound, effective and consistent application of rules on anti-money laundering and terrorist financing to investment-based crowdfunding platforms. The Q&A aims to promote common supervisory approaches and practices in the application of anti-money laundering rules to investment-based crowdfunding. It provides responses to questions posed by national competent authorities in the course of ESMA’s work on investment-based crowdfunding, drawing on expert input from the Joint Committee sub-committee on Anti-Money Laundering. The Q&A is aimed at national competent authorities to support them in ensuring that their supervisory approach is effective, taking into account the characteristics of and risks associated with different aspects of investment-based crowdfunding platforms. Not all invstment-based crowdfunding platforms have the same regulatory status. Some are within the scope of the Markets in Financial Instruments Directive (MiFID); others fall within the optional exemption provided by Article 3 of that Directive where they may be regulated under specific national regimes; others may fall outside the scope of MiFID and of those some are regulated under national law, while others are not. There are also other EU rules potentially relevant to investment-based crowdfunding platforms, such as the Payment Services Directive (PSD). Those platforms which operate within MiFID are automatically subject to rules designed to combat money laundering and terrorist financing under the Third Anti-Money Laundering Directive (3AMLD). ESMA has sought to clarify the status of the other platforms, by analysing the potential risks and issues arising in different cases and their treatment under the applicable EU rules. 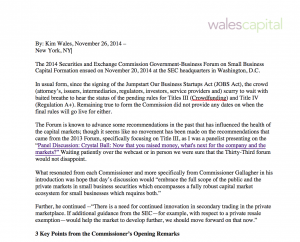 The 2014 Securities and Exchange Commission Government-Business Forum on Small Business Capital Formation ensued on November 20, 2014 at the SEC headquarters in Washington, D.C. In usual form, since the signing of the Jumpstart Our Business Startups Act (JOBS Act), the crowd (attorney’s, issuers, intermediaries, regulators, investors, service providers and) scurry to wait with baited breathe to hear the status of the pending rules for Titles III (Crowdfunding) and Title IV (Regulation A+). Remaining true to form the Commission did not provide any dates on when the final rules will go live for either. The Forum is known to advance some recommendations in the past that has influenced the health of the capital markets; though it seems like no movement has been made on the recommendations that came from the 2013 Forum, specifically focusing on Title III, as I was a panelist presenting on for the “Panel Discussion: Crystal Ball: Now that you raised money, what’s next for the company and the markets?” Waiting patiently over the webcast or in person we were sure that the Thirty-Third forum would not disappoint. An unfortunate yet necessary “Cease and Desist” action was taken by the Securities and Exchange Commission (SEC) against a crowdfunding platform, Eureeca, which is domiciled in Dubai and doing business in the Cayman Islands. As a platform conducting private placements using Title II of the JOBS Act, which allows General Solicitation, and Advertising for Accredited Investors, Regulation D, Rule 506(c) and Rule 144A has drawn significant attention since September 23, 2013, due to significant changes in rules governing certain private offerings. Historically, a Regulation D, Rule 506 offering has been exempt from SEC registration, provided that the offering is not publicly advertised and that the purchasers are largely qualified institutions or accredited investors—those whose net worth is greater than $1 million (excluding a primary residence) or whose individual income exceeded $200,000 ($300,000 for couples) for the past two years with the expectation for that level of income to continue in the current year. Title II of the JOBS Act called for the SEC to lift the ban on mass marketing these offerings, provided that the issuer has taken reasonable steps to verify that the buyers of the private securities are in fact accredited. In the case of Eureeca, what are some of the things that went wrong? Eureeca’s posting of securities offerings on its unrestricted website constituted general solicitation and advertising. Eureeca had a disclaimer on its website that its services were not being offered to U.S. persons. Eureeca was not registered as a Broker with FINRA or the SEC; nor was there any disclosure of Broker of record on the platform. The roughly 465 deals listed on the platform were not registered with the SEC. There was no firewall that prevented at least three U.S.A investors from gaining access to the deal room on the site. There were no ‘reasonable steps taken to verify’ that investors are “accredited. “Accredited” investor definition was not disclosed on the platform, as a mechanism to educate the potential investor pool. As a result of conduct described, Eureeca willfully violated section 15(a) of the Exchange Act, which makes it unlawful for any broker or dealer to effect any transaction in, or to induce or attempt to induce the purchase or sale of, any security, unless such broker or dealer is registered is or associated with a registered broker-dealer. Eureeca will have to pay civil penalties of $25,000 to the Securities and Exchange Commission in 10 installments of $2500 over the next year. In my opinion they got off easy. Unless you are registered with the Securities and Exchange Commission as a Broker, or partnered with Broker, you cannot legally sell securities to the accredited investor via a funding platform using Title II, Regulation D, 506(c). The entity “Registered Funding Platform” does not yet exist until the final rules are issued for Title III and FINRA registers the platform to sell securities. Listing registered broker of record and disclosure documents on the platform is a must. Seek legal advice and or contact Crowd Finance consulting companies like Wales Capital to ensure that your platform is in compliance. August 24, 2014, 700+ days after the JOBS Act was signed into legislation, the SEC still has not released the final rules for Title III: Regulation Crowdfunding. Over one year ago, February 19, 2013, the nation’s principal leaders and experts on equity and debt‐based financing providing an in‐depth review of the extensive build out and preparation that has taken place to help entrepreneurs’ access capital through online platforms, while protecting the investors who will finance these enterprises. The group touched upon the global advancement of equity‐based crowdfunding, the significant challenges entrepreneurs still face in accessing capital and why it is vitally important that the SEC finalize JOBS Act rule makings.